Heat the oven to 400°F. Stir the stuffing, Parmesan cheese and butter in a medium bowl. Stir the soup, milk, mozzarella cheese, garlic powder and black pepper in a 2-quart baking dish. 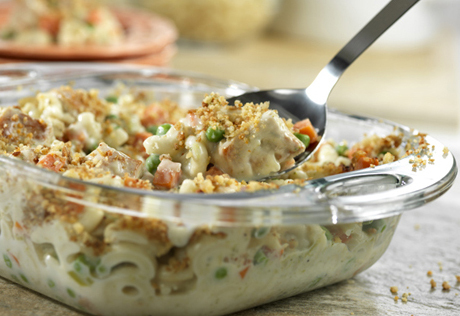 Stir in the pasta, chicken and peas and carrots. Bake for 20 minutes or until the chicken mixture is hot and bubbling. Stir the chicken mixture. Sprinkle with the stuffing mixture. Bake for 5 minutes or until the stuffing mixture is golden brown. Serving Suggestion: Serve with a Caesar salad. For dessert serve your favorite Pepperidge Farm® layer cake.